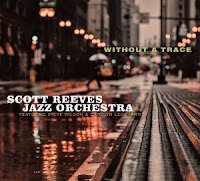 This is a good example of a large, contemporary jazz orchestra where the leader, Scott Reeves, combines all the necessary elements of the successful jazz tradition ie good material, swing, creativity, talented soloists, and excitement. Reeves has been influenced by some of the great composer/arrangers such as Duke Ellington, Gil Evans, Thad Jones, and Bob Brookmeyer and has spent years honing his craft within the current scene writing for groups such as Dave Liebman’s Big Band, and the Westchester Jazz Orchestra before setting out on his own in 2008. The opener is Kurt Weill’s classic Speak Low which starts with a nod towards Bill Evans on his ‘New Jazz Conceptions’ album and settles into a lively Afro-Cuban rhythm including lively solos from Wilson on alto and Rogers on trumpet with some closely harmonised backgrounds. 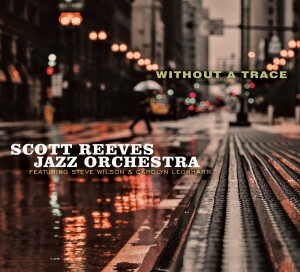 Reeves own Without A Trace follows featuring singer Carolyn Leonhart. The style of this piece with its melody containing wide intervals between some of the notes is so reminiscent of the work of our own Norma Winstone in its genre. The vocal is clear, confident and graceful – I give no praise higher than that! The standard All Or Nothing At All has drummer Vernel Fournier’s immortal groove from Ahmad Jamal’s hit Poinciana as a main rhythmic element and features the leader on slide trombone with Chiavuzzo on alto this time. Sections here are thoughtfully orchestrated and ‘quotes’ abound. The Reeves’ original Incandescence is languidly Impressionist in style with a beautifully apt vibes solo and a restrained contribution from Wilson on soprano extending the mood. Wayne Shorter’s JuJu has a more ‘contemporary’ feel based as it is on fewer chords. Here, the arranger includes a sax-section segment based on Shorter’s original solo. The whole piece is quite forward-thinking…. after chaos, into a final haunting coda – Star Trek anybody? Finally, Reeves’ tribute to Thad Jones – Something For Thad based on I Got Rhythm changes brings the album to a cheerful, swinging, boppish, slightly more conventional, closer with Haviland and Gravish having their only solo outings. Throughout the CD, the standard of musicianship is extremely high, there is a broad range of material carefully arranged with nods towards the history of jazz making this an altogether agreeable listen. Scott Reeves: (flugel. trombone, arranger); Steve Wilson (soprano,alto,flute), Vito Chiavuzzo (alto, flute) Rob Middleton (tenor, clarinet), Tim Armacost (tenor), Terry Goss (baritone 1- 4) Jay Brandford (baritone 5 – 7 ). Seneca Black, Nathan Ecklund, Chris Rogers, (1-4) Bill Mobley (5 – 7), Andy Gravish (trumpets). Tim Sessions, Matt McDonald, Matt Haviland, Max Siegel (trombones). Jim Ridl (Piano), Dave Elson (Vibes 4), Todd Coolman (Bass), Andy Watson (Drums).